Yaaay!!! Its bye bye to 2012 already! God has been faithful and we all are grateful. Hmmmnn from January to December, things have happened oh! I know we all have different stories to tell. As for me, if I am to describe my 2012, I would simply say it was a year of pleasure and pain. But all in all, I came out strong. Lets talk about the gains/losses of 2012. Some people found true love this year, so many got married this year, some had babies this year, some got their dream jobs this year, some graduated this year and so much more. Same way, some had terrible heartbreaks this year, some lost a dear one this year, some went through life-threatening illnesses this year, some broke hearts this year. Many different things have happened to each and every one of us in the course of the year 2012. With each experience, we have learnt lessons. They say, ‘what doesn’t kill you, makes you stronger’. I strongly agree. ‘With each tear, there’s a lesson, it makes you wiser than before, makes you stronger than you know…’Na so Mary J Blige talk am. The beauty of making mistakes is our ability to learn from them and for others to also learn from them. While we are counting our blessings, looking back at the last 365 days and all God has done for us,it is also pertinent for us to reflect on our mistakes. Let us do a little soul searching, reflect on the highs and lows of 2012. It is also important to make reconciliations. If you have hurt someone in anyway this year, I implore you to make amends. If someone has hurt you this year, please try and let it go. Its not the easiest thing to do but trust me, you don’t need that kind of baggage or let me call it gabbage in 2013. Leave the BS in 2012. To those who made mistakes in 2012, try and note them in order to avoid a repeat episode of such mistakes in the future. To those who found love in 2012, I wish you the best of love. Keep loving like it’s the first day. Trust me, it takes courage to really love someone, so do it right. To those who lost love, believe that all things happen for a reason. The loss of a relationship can be a traumatic experience but no matter what has happened, the only hope of a healthy future relationship is to let go of the past. The best is on the way. To those who got married, keep the love in your hearts and don’t you ever take things for granted. You need to give your all since you’ve said the two powerful words ‘I DO’. To those who are single, don’t feel unhappy because of that. Enjoy every bit of your alone time. Who knows? 2013 might bring you ‘THE ONE’ *winks*. Keep hope alive. All in all, I wish you all the very best of LOVE in 2013. 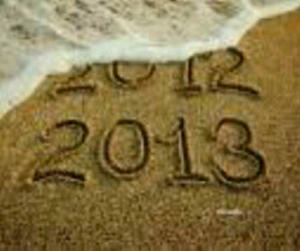 We’ll all be here at the end of 2013 by God’s grace. This entry was posted in Uncategorized on December 30, 2012 by L'QUEEN. Hmmmm! Mixed feeling dey catch me oh!! Na laid back pidgin style we dey so *winkin’*. Buh true true, what doesn’t kill us makes us stronger. Dear relationship blogger LQ, thanks for the inspiration and enlightenment and other students of love(like me), enjoy and express God’s love in 2013. Ciao! It is indeed a wonderful year…God is sure a convenant keeping God…He has been forever faithful…. Lol @ ur comment on the single ppl! This year was really fast whew!! Didn’t even know how it passed so quickly!! Nice article by the way (Y)!!! But its not easy to let go of ppl that annoyed you during the year if they don’t man up and apologise, just saying. Nice piece again.